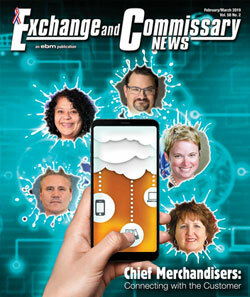 Welcome to Exchange and Commissary News (E and C News) on the Web! To receive the full E and C News issue every month, Click here. And in this issue, we interview five top executives on the exchange side of the military resale equation. When you read their reports, you will note their dedication to and their love for their individual services … their depth of involvement … their ideas for future growth … and their belief in the viability of the entire system. No outsider could ever match their passion, or do what they do. On March 1, the Pentagon’s acting chief management officer, Lisa Hershman, signed a memo greenlighting continued preparation for “Enterprise Management of the Defense Resale Enterprise.” Everyone should pause, take a step back, and digest exactly what that means. Does this mean that there will be a mad rush immediately to consolidate the separate military exchange systems and the Defense Commissary Agency (DeCA)? Does it mean that planning for consolidation will continue? The deputy secretary of Defense — a position filled at press time by DoD Comptroller David Norquist, acting as deputy secretary while the Senate-confirmed deputy, Patrick Shanahan, is acting as Defense secretary — has to approve the consolidation before it can proceed. It seems unlikely that the Pentagon, after expending as much money, energy and image as it has on this consolidation effort, would back off from approving the business case presented by the reform task force, no matter how deeply flawed it may be. A report to Congress is required, laying out the business case, as well as objections voiced to it, and including a timeline for converting DeCA to nonappropriated-fund (NAF) status. This report was originally due on Capitol Hill on Jan. 1, but the deadline has been extended until March. Completely consolidating all resale activities would require a change in law. Congress would have to repeal the section of Title 10 of the U.S. Code that requires that commissaries be operated separately from exchanges. The March 1 CMO memo recommends this change in law. It’s possible, of course, that Congress could change the direction of resale “transformation.” With enough input from stakeholders, patrons and suppliers, it could shift the focus toward combining strictly backroom functions (accounting, ordering, etc. …) and requiring an accelerated pace of collaborative effort, but retaining the individual service-branch-mission-oriented entities much as they have been. Lawmakers must look beyond the Pentagon report. They should examine the BCA itself … study and understand the objections to it … go over the project launch and other plans … and listen to voices that have been overlooked or not yet heard: suppliers, employees, customers. Then they must determine how much it will really take to fund the new in-house conglomerate; from whose pockets the funds will come; and whether or not the end result would improve the return-on-investment to the nation’s servicemembers and their families.